• Grant Wacker, America’s Pastor: Billy Graham and the Shaping of a Nation (2014). Captures Graham’s aptitude for capitalizing on the trends that shaped America in the twentieth century, thus making America’s story his own. • William A. Martin, Prophet with Honor (1991). Presents over 700 readable pages of well-documented narrative. 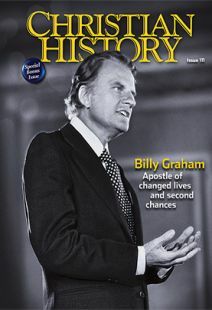 Covers the 72 years from Billy Graham’s birth to his 1990 Hong Kong Crusade. • Billy Graham, Just As I Am (1997). This memoir of ministry to the famous, the infamous, and the ordinary concludes with Bill Clinton’s second inauguration. Graham’s constant theme is wonder and gratitude for God’s leading. • David Aikman, Billy Graham: His Life and Influence (2007). Time magazine’s former bureau chief in Eastern Europe, Beijing, and Jerusalem traces the way Graham used powerful connections to minister in high places and evangelize in difficult ones. • Ken Garfield, Billy Graham: A Life in Pictures (2013). Draws on Garfield’s insider knowledge as former religion editor at Graham’s hometown newspaper. Written with affection for Charlotte’s favorite son and richly illustrated from the Charlotte Observer’s archives. • Nancy Gibbs and Michael Duffy, The Preacher and the Presidents: Billy Graham in the White House (2007). Two veteran Time magazine journalists track the way Graham and the politicians he ministered to influenced each other. • Andrew S. Finstuen, Original Sin and Everyday Protestants: The Theology of Reinhold Niebuhr, Billy Graham, and Paul Tillich in an Age of Anxiety (2009). America’s Christians in the middle of the twentieth century weren’t as upbeat and shallow as many suppose. These three influential thinkers gained prominence precisely because their theology took evil seriously. • Steven P. Miller, Billy Graham and the Rise of the Republican South (2009). Traces Graham’s role in helping the South say good-bye to Jim Crow and to Democratic Party dominance. • Garth M. Rosell, The Surprising Work of God: Harold John Ockenga, Billy Graham, and the Rebirth of Evangelicalism (2008). Tells how a Boston pastor brought Billy Graham’s evangelistic energies to the Northeast and then worked with him to nurture evangelical institutions of national influence. • Brian Stanley, The Global Diffusion of Evangelicalism: The Age of Billy Graham and John Stott (2013). In the second half of the twentieth century, the evangelical movement spread from the British Isles and America to Asia, Africa, and Latin America. Graham, Stott, and others created networks and resourced preachers and teachers from the Global South. • George M. Marsden, Understanding Fundamentalism and Evangelicalism (2010). Marsden, who famously defined an evangelical as “anyone who likes Billy Graham,” surveys this constantly evolving religious movement. • Darren Dochuk, From Bible Belt to Sunbelt: Plain-Folk Religion, Grassroots Politics, and the Rise of Evangelical Conservatism (2012). Beginning in the 1930s, southern preachers in California laid the groundwork for locally oriented, “color blind,” probusiness, anticommunist politics among newly prosperous suburban congregations. Graham’s stunning success in Los Angeles and his friendship with Ronald Reagan helped mainstream this movement. • Patricia Cornwell, Ruth, a Portrait: The Story of Ruth Bell Graham (1997). A newspaper crime reporter turned novelist draws on her deep personal relationship with Ruth Graham. • Marshall Frady, Billy Graham: A Parable of American Righteousness (1979). At times irreverent and angry, this perceptive reporter effectively sets Graham in his cultural context as an idealized icon of America’s hoped-for innocence. Also watch for . . .
• The Billy Graham Center Archives. The premier collection of documents and artifacts related to twentieth-century evangelism and the work of Billy Graham is housed at Wheaton College, his alma mater. The website catalogs many of these documents and offers photos, excerpts of oral history interviews, and 66,000 pages of digitized sermon materials. • Billy Graham Evangelistic Association. Offers audio recordings of 1,600 Billy Graham sermons as well as general information about Graham’s organization and its ongoing ministries.